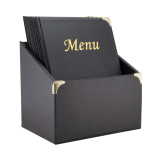 What is an American Style Menu Holder? 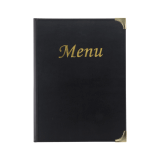 An American style menu holder uses clear menu holder pockets into which you can insert your own menu on sheets of A4 paper. 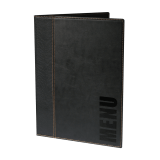 You're free to insert a printed front and rear cover or use the pockets solely for your menu. 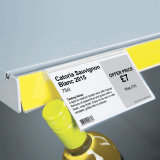 What are the benefits of this style of clear menu holder? 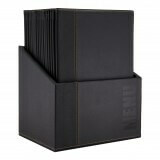 These practical and cost-effective menu holders wipe clean easily and have reinforced edges and corners to make them extra resilient. 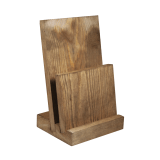 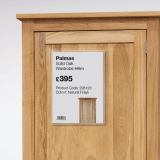 Ours has brown fabric edges and reinforced metal corners and come in a pack of three.